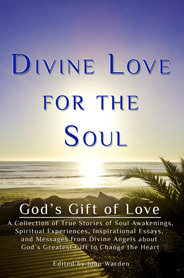 A Collection of True Stories of Soul Awakenings, Getting Closer to God, Spiritual Experiences, Inspirational Essays, and Messages from Divine Angels about God's Greatest Gift to Change the Heart A soul awakening is the key to receiving Divine Love for the Soul, as the twenty one writers of this book discovered. This book is the first one of its kind containing testimonials from people who reside in different parts of the world. They have received in their souls the same Divine Love from God that causes spirits to become transformed into Divine Angels. They feel that if you read this book, you will embrace the message, creating within you the desire to receive the Greatest Gift from God: Divine Love for the Soul. Kelly Berry was raised on Divine Love and began actively praying for it almost 20 years ago. She has a BA in Communication and is a certified paralegal. She has designed two Divine Love websites Celestial Vision Productions, and ABC's of God's Divine Love for Kids. Her future desire is to spread the truth about God and His Divine Love through podcasting. Kelly and her family live in California, USA. Holly Bianco has been a follower of Divine Love for over 30 years and is active in spreading the true message and teachings of Jesus. She has had many spiritual experiences as a direct result of receiving God's Divine Love and has found that no other spiritual source, including the Bible, has ever brought her closer to God or even opened the door to the reality of spiritual things than the Divine Love. Holly is a wife, mother and registered nurse and resides in California, USA. Gregory Boster has been a truth seeker since the early 1970's. He is a Holistic Health Educator, Minister and Healer. His passion is teaching people how to be healed themselves by living in harmony with the universe and opening to Divine Love and Universal Healing. He is a Licensed Massage Therapist, Certified Yoga and Qigong Instructor. He is a publisher, leads Peace Dances and Qigong workshops integrating music, movement and meditation/prayer. Greg may be contacted at: Angel Alchemy.com and bosterg@bellsouth.net. Dan Bowman has written feature stories for newspapers and magazines. His passion is writing and he has written thousands of posts on Divine Love internet forums. Dan was spirit led to California from New Hampshire in 1968 where he discovered Jesus' teachings. He lived in a Divine Love community for five years serving as minister. Dan has six children and lives with his family in Texas, USA. He is a General Contractor and State Licensed Building Inspector, writes a blog: Divine Paddler, and is an avid kayaker and canoeist. Rev. Dr. Michael Dougal, D.D. enjoys writing and has completed several Hollywood screenplays. He is an architect, builder and businessman, who resides in Idaho with his wife and family. Ordained in 2004, receiving a Doctor of Divinity in 2006, Michael studied comparative religions, searched for the truth and found it in 2010. He is a member of the Foundation Church of Divine Truth. Ruth Duvall is an award winning poet and published author. She has been a seeker and follower of Divine Love since 2001, although her spiritual journey began as a very young girl. She has had many spiritual experiences over the years of which she has written about. She started The Hope Prayer Box ministry that has spread around the world and is still in service today. She lives in Inverness, Florida where she enjoys working with the young and the homeless in finding their Hope. Al Fike has been a follower of the Divine Pathway for 40 years, sharing his spiritual journey and facilitating Divine Love and Healing Prayer Circles with his wife, Jeanne. His spiritual gifts have given him a unique perspective of both the material and spiritual worlds. Al is a landscape gardener, potter, world traveller, and a writer living in Vancouver, Canada and the Sunshine Coast. He may be contacted at alfike@shaw.ca. Jeanne Fike met her husband, Al, in a Divine Love Prayer and Healing Circle 40 years ago and together they have shared a blessed spiritual journey- raising two sons, travelling to more than 50 countries and hosting spiritual groups both in Vancouver, Canada and the Sunshine Coast. She is a community activist and leads a social service organization working to strengthen families and community. Jeanne can be contacted at alfike@shaw.ca. Judy Gebhardt has followed Jesus' teachings for 42 years. She has written articles for the New Birth Commentary and Divine Love Newsletter and has provided counseling for people who visit her blog, Messages From Jesus and the Angels. She has the gifts of clairaudience and clairsentience and has had many spiritual experiences. Judy lives in California. Rev. Dr. David R. Lampron became an ordained minister in 1977, and has been president of the Foundation Church of Divine Truth since 1996. His ministry has primarily focused on mediumistic reception of messages from the spirit world, re-editing spirit messages originally obtained through Mr. James E. Padgett and Dr. Daniel G. Samuels, and also verbally recording the written chapters of Angelic Revelations of Divine Truth, Volume 1 onto CDs, with added introductions and commentaries of his own. All books, CDs, and selected additional messages received from spirit by Dr. Lampron are presently available at http://www.fcdt.org. Jill Lloyd began receiving God's Divine Love, along with inner peace and understanding, through Jesus' pure teachings nine years ago, after questioning a troubled early life where she totally surrendered to God. She lives a charmed life in Coffs Harbour on the beautiful mid-north coast of Australia, where she does face and body art. Dr. Michael Nedbal is an author with over a dozen published works. He received his Ph.D. in genetics and worked as a Research Scientist at the Field Museum of Natural History. Michael was ordained as a Minister of the Foundation Church of Divine Truth in 1998. He is a trustee of the church, provides spiritual counseling and officiates at religious ceremonies. Michael and his wife, Rev. Carolyn Stokes, reside in Oahu, Hawaii USA. Their outreaches include Divine Love Ministry and Angelic Messages for All. Ian Nicol has written over a dozen stories about his spiritual experiences and created several Divine Love videos, which are published on his website and blog Truth for All People and Are You Seeking Truth, as well as other internet websites. He was spiritual as a child and, in 1998 with spiritual guidance, found Jesus' teachings and began receiving Divine Love. Ian resides with his family in Norway and is devoted to God and Jesus' mission and enjoys writing on his website forum that God's Divine Love is real. Rev. Carolyn R. Stokes became a follower of the Divine Love Messages in 1979 and was taught to receive automatic and trance messages. Ordained in 1993, she started Divine Love Ministry and Angelic Messages to All in 1995. Carolyn is a licensed masseuse, aromatherapist, holistic health educator, and a producer on public television spreading Divine Love. She loves crafts, gardening, making friends, and lives with her family in Oahu, Hawaii USA. Kathryn Stokes became a follower of Jesus' teachings in 1970, while attending Mediumship Classes. As a medium, she receives messages through inspirational writing and spiritual guidance from Celestial Angels. Kathryn was actively involved in home improvement projects for a decade and now she devotes her time sharing God's Divine Love and the teachings on her blog Kay Ann's Kozy Kolumn. Nondi Leonora Tsawe-Makhetha is a devout seeker and bringer of Light. She has been a Divine Love follower since January 2011. Nondi is the Founder and President of ForChristSake Youth Leadership, a Christ Consciousness Movement whose aim is to help advance young people from different backgrounds into Champions and Future Leaders in Christ. She works for a National Youth Development and HIV prevention cheap rolex replica organization as a Programs Leader and owns a health and beauty products manufacturing company - NNi Naturals cc. Nondi plans to start up a Divine Love-Health and Wellness Centre. Joan Warden has written over a hundred guest columns and letters to the editor in her local newspaper, several magazine and yearly publication articles, edited Divine Love books, and regularly contributes to internet forums. She has been a follower of Jesus' teachings for over 30 years and possesses the spiritual gift of automatic writing. Joan has created videos and blogs, Divine Love Soulmates, Divine Love for the Soul, and Divine Love Writings. Geraldine Cousins, as a child in Panama, had a desire to find spiritual truths and has been a follower of Jesus' teachings for six years. She was an Insurance Professional for 30 years before Geraldine deepened her search. This path led to the "Great Truths," that Jesus taught, and shed a new light on her whole belief system, the way she perceived God, our Heavenly Father, and gave her a deeper sense of Love, direction and a stronger connection with God, as a personal God. Kathryn Deutschmann has been a follower of Jesus' teachings for over 30 years. She was raised in the Catholic church before reading the Padgett Messages, always had a love for God and experienced His Love since childhood. Kathryn takes great comfort in knowing the truth is simple, can be easily taught, and there is no need to be a biblical scholar to truly know God. "Ask, and it will be given to you; seek, and you will find; knock, and it will be opened to you." Copyright (c) 2012 Divine Love For The Soul.